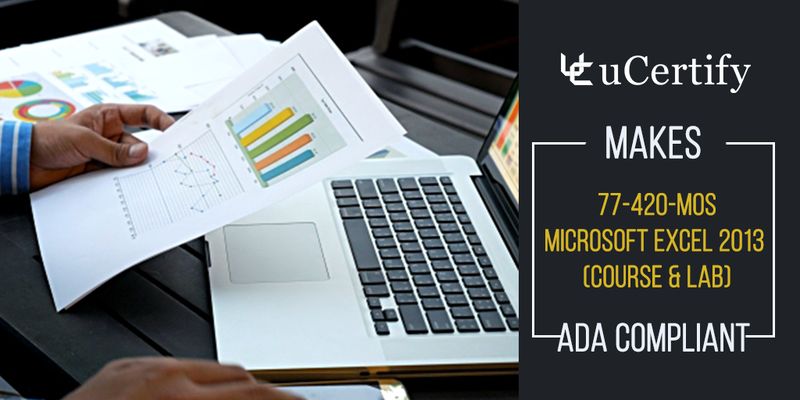 77-420 – MOS: Microsoft Excel 2013 (Course & Lab) covers all the essential components of Excel and provides clear and practical examples that you can adapt to your own needs. In this book, there is a good balance between the basics that every Excel user needs to know and the more complex topics that will appeal to power users. Labs included in this book would help user a better understanding of excel 2013. 77-420 – MOS: Microsoft Excel 2013 (Course & Lab) uses content from well known publishers, instructors, and subject matter experts. They have a minimum of 15 years of experience in their fields. uCertify brings these textbooks to life. It is full of interactive activities that keeps the learner engaged. uCertify brings all available learning resources for a topic in one place so that the learner can efficiently learn without going to multiple places. Challenge questions are also embedded in the chapters so learners can attempt those while they are learning about that particular topic. This helps them grasp the concepts better because they can go over it again right away which improves learning. Learners can do Flashcards, Exercises, Quizzes and Labs related to each chapter. At the end of every lesson, uCertify courses guide the learners on the path they should follow. The MOS: Excel 2013 is a standalone certification from Microsoft with the exam code 77-420 . This certification is targeted at professionals who can create and manage worksheets & workbooks with Microsoft Office Excel 2013 and may have experience with previous versions of Microsoft Office Excel. They can also perform tasks like creating tables, applying formulas and functions, creating charts & objects. This exam is an upgrade of Microsoft Office Excel 2010.